And well — I did just that! 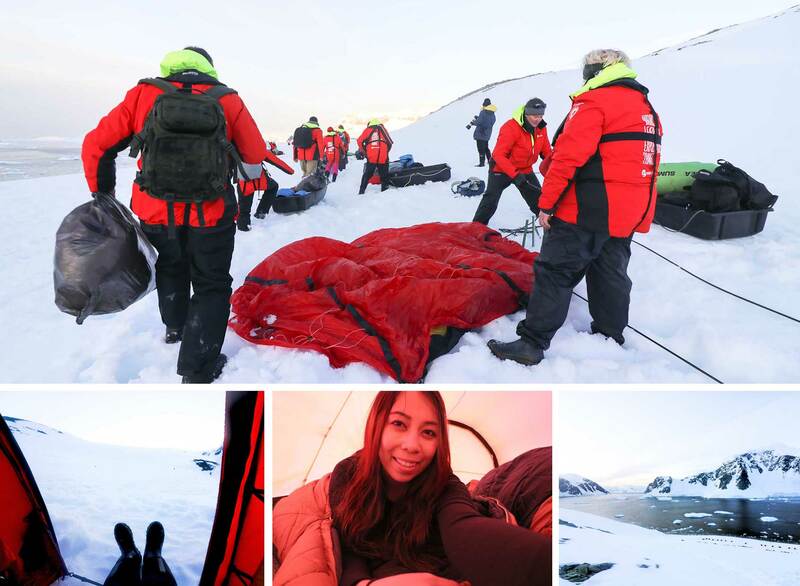 I slept under the amazing Antarctic sky with only the thin wall of a tent separating me from the elements, and it was such a memorable once-in-a-lifetime experience. Now, a lot of IAATO (International Association of Antarctica Tour Operators) companies such as the provider I went with (called as Hurtigruten) provides camping as one of the optional things to do in Antarctica. As early as now, I highly recommend that you to take this wonderful opportunity when you’re going on an expedition cruise to the ‘White Continent’ because it’s not everyday that you can say that you’ve slept on the actual grounds of the bottom of the world (not to mention, acquiring a slot in this camping activity is often limited too). So to give you an idea (as well as some more info) about this surreal activity, do continue reading below to read about my experience! Is it safe for us? Absolutely. You do NOT even have to be an experienced camper because just about anyone can do camping in Antarctica. Also, remember this: you’re in the hands of experts who are particularly knowledgeable about the Antarctic terrain, so as long as you follow their instructions, you’ll be fine! Besides, the expedition team who will be with you for the rest of the night will always be in constant communication with the ship (which is located not too far away from where you will be). So if conditions get worse, the activity will either be cancelled or everyone will be whisked away back to the ship via zodiac boats. Is it safe for the Antarctic environment? First things first, IAATO-approved tour operators will always ensure that camping in Antarctica is held in a place that will NOT disturb any of the wildlife — but it is possible that the surrounding penguins will come and disturb you with their ‘calls’ *wink*. Secondly, as I will be discussing in the third section below, there will be strict regulations that will be implemented in order to preserve the pristine beauty of the continent. So after the overall activity, nothing will be left behind, may it be camping gear, food, human waste, etc. While we’re discussing food, NO campfires will be done. So nope, you can’t warm up by the fire, roast some marshmallows and drink a hot cup of chocolate — that’s an experience you’ll have to enjoy somewhere else. Drinks are also NOT allowed except for the bottle of water provided. Naturally, NO throwing of any waste on Antarctica. Speaking of waste, that includes human waste too. For my case, my ship with Hurtigruten typically brings disposable toilets that will only be used for when it’s really needed (after the camping in Antarctica, these will be brought back to the ship for discarding). No brushing of teeth is allowed either. You can do this before you leave for the camping or once you’re back on the ship on the next day (since departure is at early in the morning). Do NOT walk away from the camp. All IAATO rules regarding wildlife are to be followed at all times, meaning that you must keep at least 5-meter distance from penguins — no touching and no stressing them. Try to maintain silence. No shouting or making unnecessary noises. Temperature in the continent starts to drop when the night creeps in; but rest assured, since it is summer season, it will be quite bearable. (During my camping in Antarctica, the night reached only about -5° celsius). What do I bring for the camping? The ship will be providing each pair of guests the following high-quality gear that are up to Antarctic standards: a strong 3-person tent, 2 breathable bivouac or bivy bags (rated for extreme sub-zero cold temperatures), a big foam pad (for added warmth) and 2 inflatable sleeping pads or mattresses. Flashlight (or your phone is enough; this is helpful especially around March when the sun briefly sets. TRIVIA: Around November to February, there is 24 hours of sunlight). NOTE: For a complete Antarctica packing list, read here. The overall process will differ from ship to ship, but the following endeavour with Hurtigruten is pretty much how things would work out. Mandatory briefing. In the morning, every participant was required to attend the mandatory briefing so that we are well-informed of the rules and the overall schedule of our camping in Antarctica. Departure. After dinner, we met at 8:30PM on the lower deck so that we can all be taken by the zodiac or polarcirkel boats to our camping ground in Danco Island or Isla Deco (other cruise providers will most likely use other locations; though if I my say so, this place was just perfect and the photos below will show you why). Setting up of the camp. The expedition team will mark the areas where we are supposed to set up our tents. After picking a spot, Jonas and I swiftly started to work on pitching up our tent. At that point, I started to feel nostalgic as I realized how much I missed camping! Anyhow, everything was smooth-sailing and easy (with some penguins watching us curiously from a few meters away) — …until it was time to put down the pegs. You see, the snow was really hard; but thankfully, the expedition team was there to help us hammer everything down in order to keep our tent in place (after all, the winds will pick up later on so it was important that everything was firm). All in all, it took everyone an hour to have every tent and gear in place. Free time. The weather was pleasant that night so the expedition team decided to do a short hike on the nearby hill in order for us to get an amazing panoramic view of our surroundings as well as visit the gentoo penguin colony that was on top. Everyone was free to join; otherwise, staying in the camp was fine — naturally, Jonas and I went with the hiking crew and though the winds were really harsh on top, the views really were just worth the effort! Once we headed back down, some people immediately slept, some remained outside to mingle, some have dragged their bivy bags to sleep out of their tents, and some kept snapping away with their cameras. Me? I did snap some more photos and videos around me and mingled with our neighbors, but after I went back to our tent to ‘briefly’ catch some warmth from my bivy bag… I just blacked out. Haha, I guess I was exhausted! But yes, the bivy bags were really cozy and warm — sometimes even too warm so I suggest that you sleep in it with just your thermals on. If you happen to be on a cruise sometime around March, you’ll catch the glorious yet short-lived sunrise and sunsets in Antarctica. I went here around December so I basically had 24 hours of sunlight. However, sometime in the night, the sun did start to mellow down a bit which gave us pinkish hues on the horizon. Departure. At 5:00AM, everyone was up and ready to start taking down the camp. Naturally, we made sure that we left nothing behind as we removed all traces of our presence — this is, of course, all in the effort of protecting the wildlife and the fragile environment in Antarctica. After everyone was brought back to the ship via the zodiac and polarcirkel boats, we all had a special breakfast as we happily talked about our wondrous night in the icy snow! The camping in Antarctica has been a short overnight stint, and I gotta say, it didn’t really hit me that what I did was so amazing and unique — until I got back home. I guess it was a delayed reaction; but surely, not a lot of people have the chance to say that they survived a night in the world’s coldest and harshest continent! So yes, I had a great time and you bet that it really gave me a feel of what a night could be like for past and present explorers who were/are courageous enough to brave through Antarctica’s elements. All in all, this camping experience may be brief but think about this: you won’t ever get the chance to camp on Antarctic soil if you don’t grab it during your Antarctic cruise expedition! (Unless of course, you’re one of the pros who are planning to trek the South Pole, etc.) But for us normal people, you should definitely book your spot because I guarantee you that this will become one of the most unforgettable things that you’ll do in your entire life! Want a travel guide for Antarctica? Read about more info here. Got some more questions? Read the FAQ. Would you like to try camping in Antarctica? Or have you tried this before? How was it? You are my inspiration for writing blogs. Everytime I read your blogs I feel more accomplished.